Jack Welch and his wife Suzy feel that so many leaders get it wrong: Ineffective corporate leaders hire people to run Human Resources (HR) who wish to be “kingmakers or cops.” The Welchs suggest that HR professionals must be those who are a hybrid of people who are part Pastor (to whom one may confess sins without recrimination) and part Parent (who will tell the employee straight up what they need to know in a guidance manner). They are people who have integrity, insight, and candor. In essence, a robust organization is most suitably supported with impartial business partners; not cloak-&-dagger Education majors who try to make and break careers. What Fortune 500 companies hire are Organization Development (OD) people. OD practitioners are HR folks on steroids. OD, as a field, is a strategic intervention/approach designed with support from the C-Suite to impact the entire organization’s effectiveness through its processes, systems, and structure by using behavioral-science knowledge. 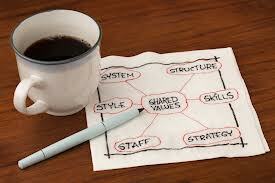 It is a key analytical position taken by practitioners who typically have a systemic (broad picture) view. OD focuses on ALL resources, i.e. materials, equipment, savings, talent, etc. – although it is a function commonly placed in Human Resources (HR). This is most likely due to the fact that two out of the four major types of OD interventions are directly related towards talent. Org. Learning & Knowledge Mgmt. The head of the OD team must have an educational background in OD, Psychology, Business, or HR. Other fields do not encompass the necessitated depth of knowledge and understanding to lead OD practitioners – who tend to be “third-eye,” philosophical, countercultural change agents. Hire an external vendor at least once a year to keep the perspective bold and fresh, and to draw Best Practices from other organizations, cross-industry. Jack & Suzy Welch. So Many Leaders Get This Wrong. 3/24/14. Posted on March 24, 2014, in Uncategorized and tagged Interventions, Jack Welch, Major Types of OD, On-Demand HR, So Many Leaders Get This Wrong. Bookmark the permalink. 1 Comment.